Regular pet store style hay racks are just too small to hold enough hay for your bunny. So we made a better one. It is my pleasure to introduce to you the Leith Petwerks Mega Hay Rack available in 12" and 20" sizes! 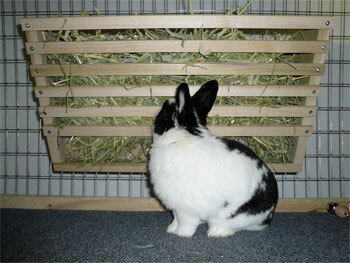 An ample 6 1/2" deep by 11" tall by either 12" or 20" wide design that fits our Bunny Abode Condos and holds lots of hay.